Each Ithildin Door Poem solution in Middle-earth: Shadow of War will provide you with one piece of the Bright Lord's Legendary gear set. Here are all of the correct poem phrases. In Middle-earth: Shadow of War, collectibles mean something. They tell a story and provide the player with lore that might be otherwise missing. 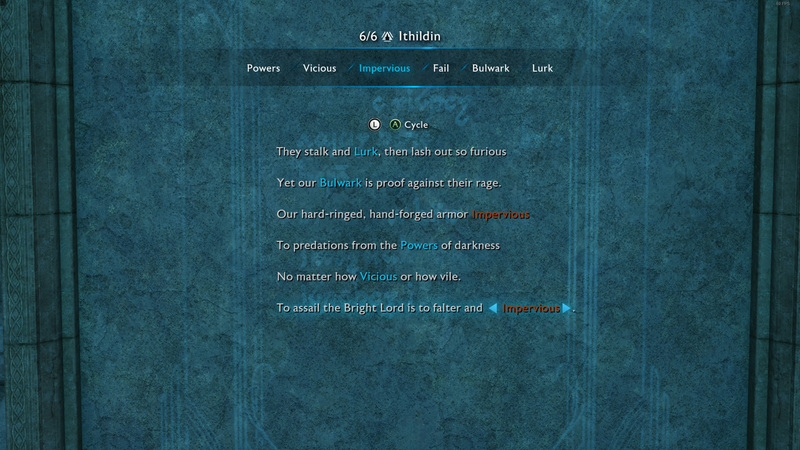 In the case of Ithildin Door Poems, they also provide the player with Legendary Bright Lord’s gear set. To get this set of Legendary gear, players must first track down six Ithildin in each region, and then use the clues that they gather to complete the Ithildin Door Poem, placing words in the correct place for the right solution. Doing so will unlock the door and allow the player to collect their prize. When players finally get settled in Middle-earth: Shadow of War, one of their first missions will be to purify a Haedir. This not only how to fast travel in Shadow of War, but it is how you locate the various collectibles on the map. Locate each Haedir in each region, and set a waypoint for its location. Climb the Haedir and use it to spot each of the six Ithildin in the region. These are required before you can attempt to provide a solution for the Ithildin Door Poem. Once you've spotted the Ithildin, you should be able to place a marker on each one, making the act of finding them quite simple. Head to the Ithildin you have selected, then enter the Wraith world to spot it in-game. Once you collect it, head to the next. Continue this process until you’ve collected all six Ithildin in that region. Once you have all six Ithildin for the region you’re in, look for the Barrows to be marked on your map. You must locate the Barrows the same way you do Ithildin; through the Haedir mini-game. You can’t fast travel there, but you can usually fast travel somewhere close to the Barrows, then walk the rest of the way. As you enter the Barrows, activate the Wraith world so that you can access the Ithildin Door Poem and provide the correct solution. 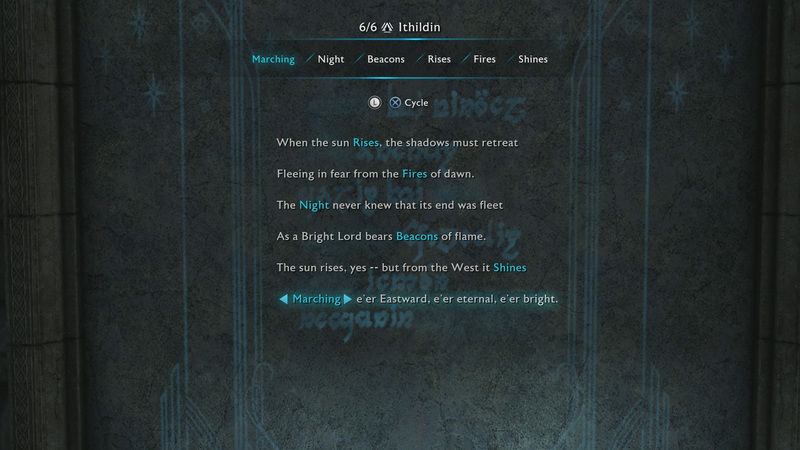 From top to bottom, here is the solution for the Minas Ithil Ithildin Door Poem. You can get this piece of Legendary gear early in your game, but completing the Challenge to upgrade it will require you to be level 20. Most Legendary gear will require you be level 20 or level 40 to meet its requirements. Completing the Cirith Ungol Ithildin Door Poem will get you the Legendary Bright Lord’s Cloak. The Cloak and Armor are the two items that you should get early in your play through. Getting them early shouldn’t be an issue, either, as you can Upgrade the items as you level Talion up. 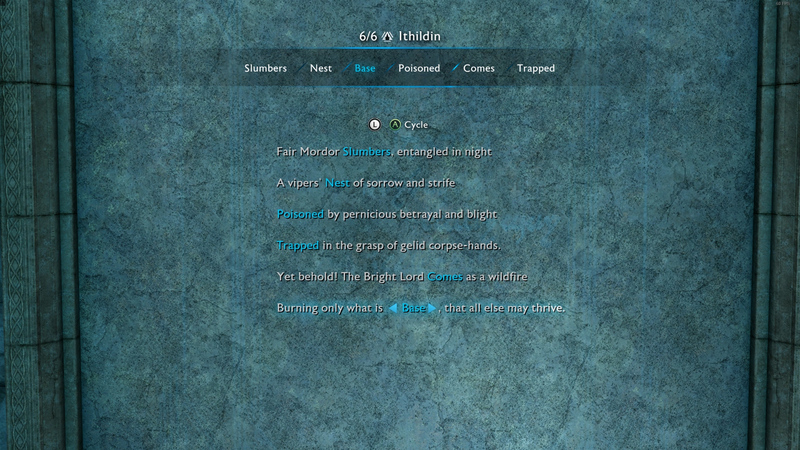 Solving the Ithildin Door Poem in Nurnen will result in players getting the Legendary Bright Lord’s Bow. This will be the third Bright Lord’s gear piece you can earn. Players can claim the Legendary Bright Lord’s Sword if they solve the Ithildin Door Poem in Gorgoroth. From top to bottom, the solutions are listed below. The Gorgoroth and Seregost regions will most likely be the final two that you unlock, so these gear pieces will be obtained when you’re a slightly higher level. 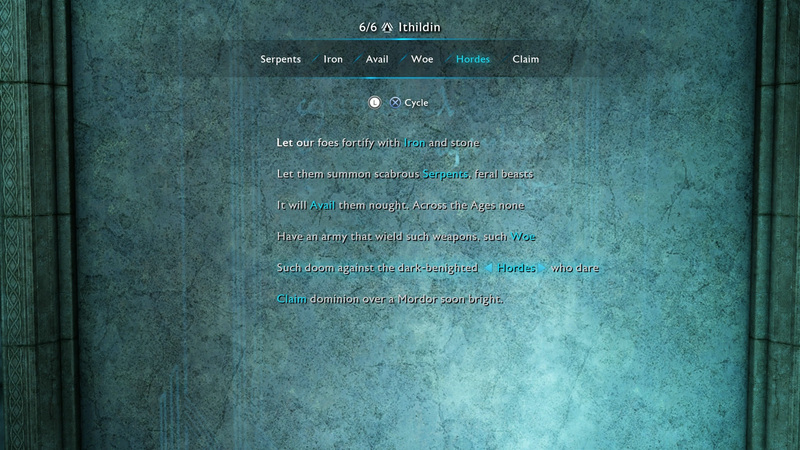 The final Ithildin Door Poem in Shadow of War is in Seregost. Although you can do them in any order, you will not gain access to Gorgoroth and Seregost until a bit further in the game. Once you solve the Ithildin Door Poem in Seregost, you will get the Legendary Bright Lord’s Dagger. The final piece of Legendary Bright Lord’s gear is the Legendary Bright Lord’s Rune. This is obtained by getting a Bronze or higher rating in all the Shadows of the Past missions, so make sure that you’re doing those, and unlocking the Skills required to complete them. 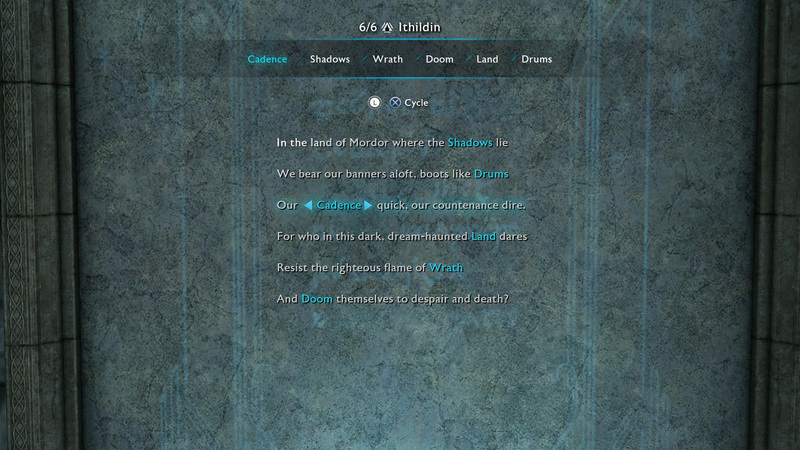 Now that you have the solution of each Ithildin Door Poem, be sure to visit the Shacknews Middle-earth: Shadow of War walkthrough and guide.